Just when you think mankind couldn’t achieve any higher heights of accomplishment, we’ve outdone ourselves again. Turns out, in going to the bathroom, we’ve been doing it wrong for thousands of years. But now, thanks to science and good-old-fashioned German engineering, they’ve invented a technology to facilitate elimination of Number Two, promote better colon health, reduce the heartbreak of hemorrhoids, and fight global climate change. They found out you’re supposed to raise your knees when you…well…you know. Hence this amazing invention. I know it just looks like a stool (ahem) , but it’s so much more; it’s Euro-Ergo Design and made of high-tech, digital polymer (not mere plastic). It’s based on decades of intense concentration and colorectal research by real doctors. An arbitrarily assigned $34 value, but yours for only $25 (plus $8.95 shipping and…uh…handling… which brings it back up to $34). 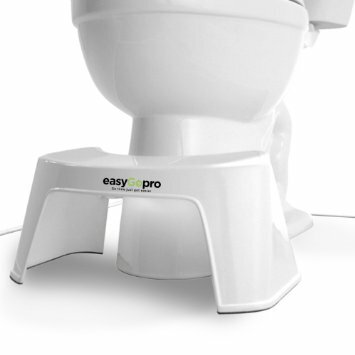 So don’t think you can just accomplish the same life-changing benefits by putting a $5 stool from Target in front of your toilet–one that hasn’t been euro-ergo designed. If you don’t believe me, just read the copy that easyGopro has to say about the company’s far-reaching goals. Look how they’ve taken this on as a mission. They even used a bang (!) to emphasize their earnestness as they set out on this quest. I mean, they trekked all the way into the bowels of “the epicenter of Los Angeles’ Historic Art District” to find award-winning euro-designer Henner Jahns of Gecco-Vision, with his “passion and commitment” to improving the way we poop. Don’t trust those other stool stool manufacturers with their feeble, non-euro designs, like the family-owned Squatty Potty or The Original Step-n-Go (who have no cute euro-designers). Even though they say so, they’re not nearly as passionate , or committed, about the best alimentary elimination possible(!). 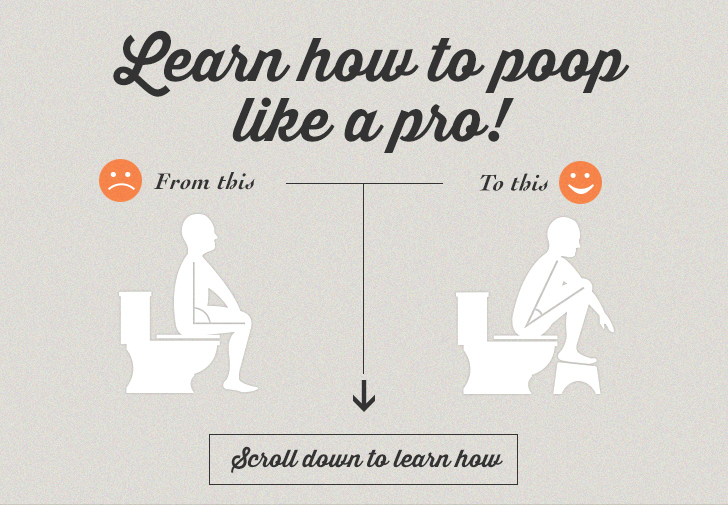 To add to the marketing punch, all of these companies feature state-of-the-art animations and graphics showing what your inner plumbing looks like when you sit on a toilet versus when you squat the correct way…the way God intended. If that isn’t inspiring to you, then you must be dead down there already. EasyGopro‘s website also features a highly informative video with Henner talking in his charming, German-Engineering accent about BMs…for four-and-a-half intense minutes. You wouldn’t think there was that much to say about it. But you’d be wrong. His passion, his commitment (and his great hair) are infectious. I know it looks like a satirical commercial on SNL, but it’s actual marketing! They’re serious. I HONESTLY HAD NO IDEA I WAS SUCH AN AMATEUR. 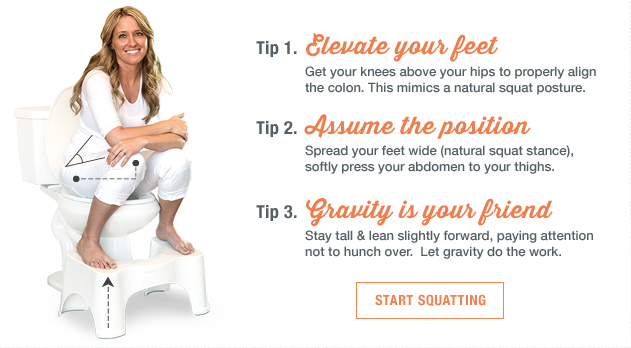 And speaking of great marketing, I also love coy exhortations (as on the Squatty Potty site) to “Poop like a Pro” or “Go time just got easier” (on the easyGopro site). Those bring up so many doubts about how unprofessionally I’ve been getting through my life and how hard it’s been; these are truly existential questions about self-worth. And, as we all know, creating self-doubt is one of the core rules of marketing: Do I smell bad? Am I not living up to my potential? Am I a terrible parent? How long has that thing been there? Am I in a dead-end job? Are my teeth not white enough? Will I not be able to perform when my wife gives me that “look”? Am I losing valuable nutrients by not juicing properly? And now, am I not going to the bathroom like a pro? 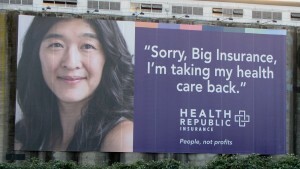 Don’t you hate your health insurance company? 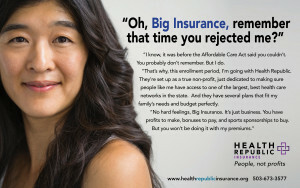 Here you pay high premiums every month and when you get sick and need them to step up, they start welching on the bet. Or they won’t authorize a procedure or a test your doctor thinks you need. Or worse, they just drop you. “Eeeeyew! Sick! Sick! Pre-existing cooties! Get away!” And good luck in those not-so-long-ago days trying to get new insurance once you’ve been ejected from the plane. Then along comes the ACA (until the Supreme Court ejects it, that is) and not only are health insurance companies not allowed to reject you anymore, each state that wants it can set up a true-non-profit insurance company that’s focused on getting health care to people instead of placating grumpy shareholders with dividends. It’s a CO-OP, or Consumer Oriented and Operated Plan and their goals are to drive costs down without taking it out of the hides of the rest of us. 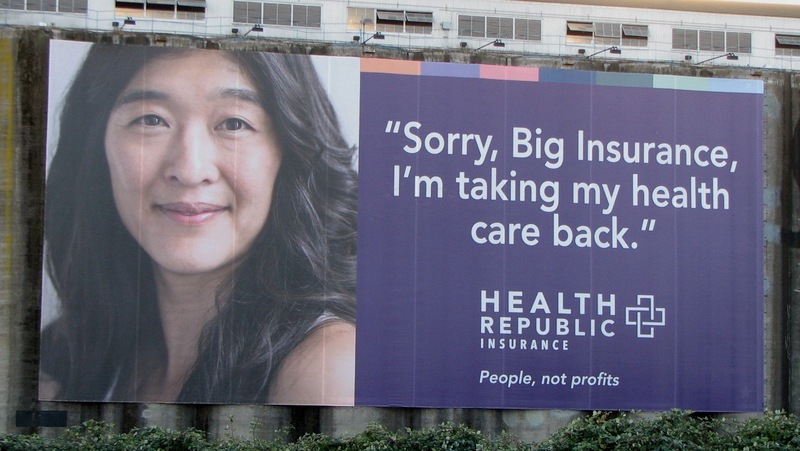 The idea of Health Republic (and all state CO-OPs under the ACA) is to offer a true-non-profit health insurance alternative to the for-profit insurance giants who have been dominating the delivery of health care in our country since they figured out they could make much more money by denying care. CO-OPs are run by their own members. They don’t have shareholders and the boards are elected by and sat on by members. They are also legally constrained from making profits, paying out executive bonuses and seven figure compensation packages, shifting surplus revenues into offshore tax havens, or buying multi-million dollar sports arena sponsorships. 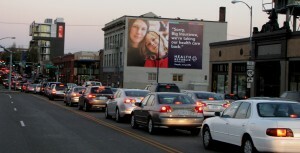 Which has made this campaign so gratifying to work on. One of the first ads to run in it is this gigantic (125′ x 60′) outdoor board hanging on the massive grain elevator on the Willamette River, right opposite Portland’s sports arena, the Rose Center. Last year this was renamed in a controversial $40 million sponsorship, the “Moda Center.” Moda is Oregon’s largest for-profit health insurance company. And there was a lot of outrage over them spending so much to stick their logo on it (not to mention all the corporate boxes inside, and the simultaneously leaked story about the CEO’s inflated compensation package), especially when health costs had been skyrocketing in the country. But now, as Blazer fans emerge from the Moda Center after each game (or “Who at 50” fans from their concert), they’ll be greeted by this 60 foot tall message. This is particularly what I was thinking about from the last time I went to a Blazers game and heard all the cynical grumbling and editorial remarks from fans around me sneering about the “Moda Center.” To them, it had always been the “Rose Center” and will remain so, no matter how many millions some giant corporation dumps in smearing its logo all over it. Just like Ho Chi Minh City will remain Saigon. Damn it! East end of the Burnside Bridge, where tens of thousands struggle to get out of Portland each day. So I was thinking about those cynical, angry fans when I was working on this campaign. But it served well to introduce the new concept in an atmosphere of public indignation over existing abuses in the traditional, for-profit, health insurance industry. 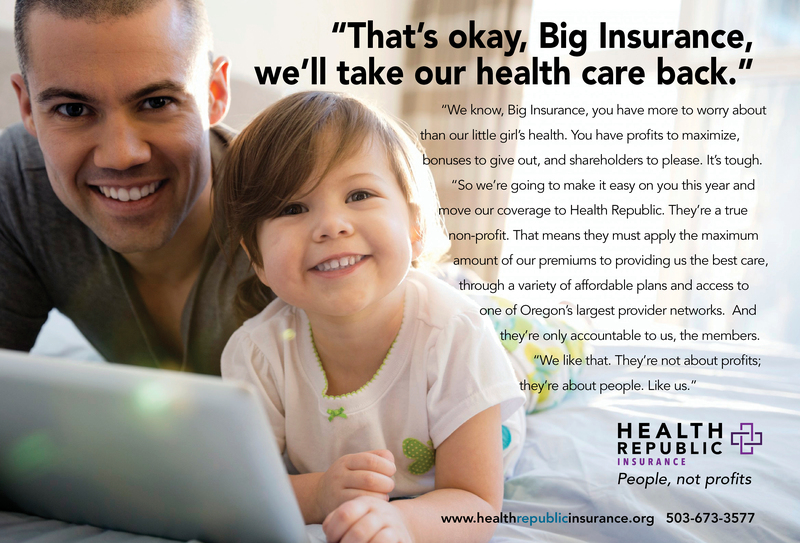 Thousands signed up, even some who said they were doing it even though they hated the very idea of Obamacare (then call it Bushcare for all I care). Anyway, it is fun to run edgy advertising for a client that’s also the champion of a worthwhile social cause. And it’s so effective to tap into people’s gut emotions, especially when they’ve made them so clear. Our research showed that people resent their health insurance companies. Most people, do anyway. They think it’s unjust that somebody seems to making a profit out of their misery and sickness. People have been yearning for a different system for decades. So now along comes a different system, one that treats health insurance like a publicly regulated utility, one that can’t make a profit on your premiums. One that’s governed by its very members. And people have been snapping it up. Nothing new in the advertising; just straightforward, old-fashioned, raw emotion. Unbreakable Rule #7. 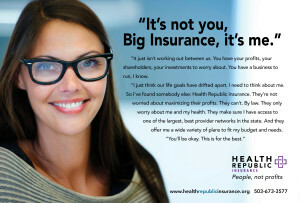 And you’ll be okay, Big Insurance. This is for the best.